When God has something He wants you to hear, He will speak it loudly and clearly. He had a message for me. In His own special way, He didn’t speak through one messenger. He sent FIVE! The most awe-inspiring part of this story is how He directed me to ask these 5 women to speak at our Mamas Write Conference. Through various conversations and friendships each chosen by the Spirit’s leading. Reflecting back on the 9 to 5 Saturday, my jaw drops and my arms raise. Who but God could orchestrate five different women from five different cities to speak a stream-lined message? As He prepared their power points and videos, He stirred my heart. Two days before the conference I shared with my friend, Eryn Hall, how I was at a crossroads. I needed to go one way or the other in the world of writing. I was hopeful He would speak. As usual, He did not disappoint. Focus. Direction. Remembering why I’m writing. 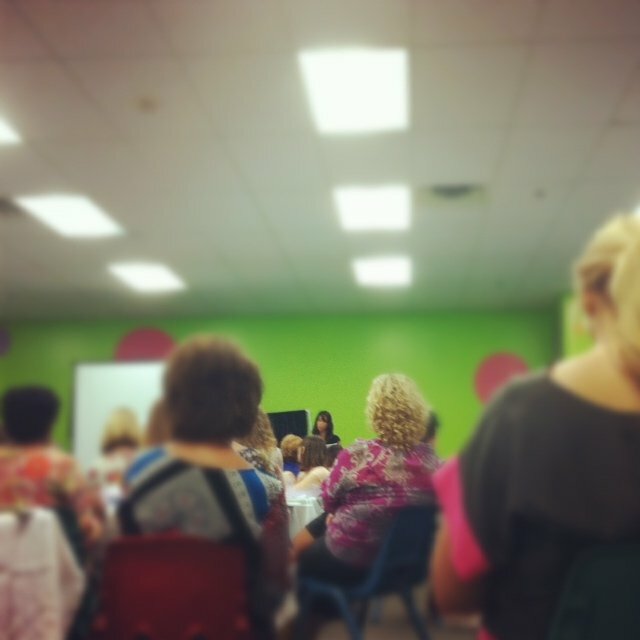 Mandy had us identify our core relationships…starting with GOD AT THE CENTER! Seriously. God in the center (a little reminder of why I started this blog?). Then a circle around God labeled “Me”. 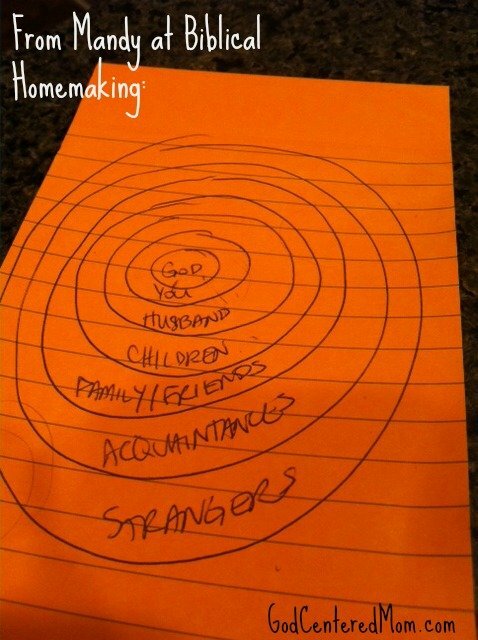 Then around me is a circle labeled “Husband”. Then “Children”. Then “Family/Friends”. Then “Acquaintances”. Finally the farthest circle is “Strangers” (aka most blog readers). Most of my time/energy/attention should be on the middle circles and move outward. Giving my best to God, my husband and my children. I know this but I don’t live it. When a good opportunity or activity is presented to me, it needs to pass the “circle test”. Is that “good opportunity or activity” negatively impacting my relationship with God? my husband? my family? Then I shouldn’t add it in. 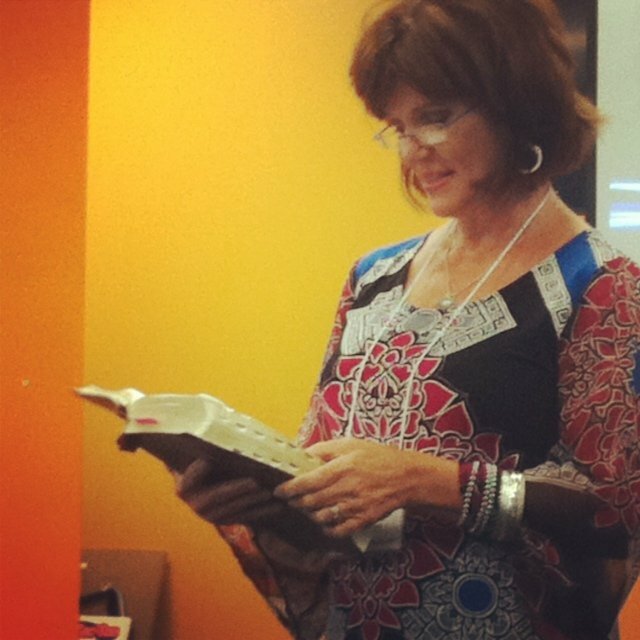 The next woman to deliver God’s message was Debi, mother to 11 children. “Guard your heart (Proverbs 4:23) and stay focused” (YES AGAIN! She wasn’t even in Mandy’s session). Further refinement of the message. Stay focused with a pure heart. THREE women telling me to focus. To focus on God. To keep my heart pure. Then comes beautiful Amy Lynn Andrews sharing what she has learned in eight years of blogging. It was a further revelation of what God would want me to stay focused on…His story! Not only do I need to stay focused. Stay focused on God. With a pure heart. BUT I should spread the good news to ALL PEOPLE. I’m continuing to munch and crunch on His message. I’m honestly sitting down with my list of commitments and determining which ones He wants me to “let go” and which require my focus. Pray for me? Lord, Thank you for these five women. Thank you for their passionate pursuit of You. Thank you for their willingness to share messages outside of their comfort zones. Thank you for giving them Your Words to share. May other women who heard them speak be just as moved to focus on You and Your purpose. Amen. Thanks for this great post! I didn’t get to stay for all of it because my husband accidentally left a work item he needed in my car. You helped me fill in on some of what I missed! Sorry you missed the end! Glad I could help. Amy & Stacy brought truth and motivated us to seek hard after Him & His purposes. It was awesome. It really was Julie. 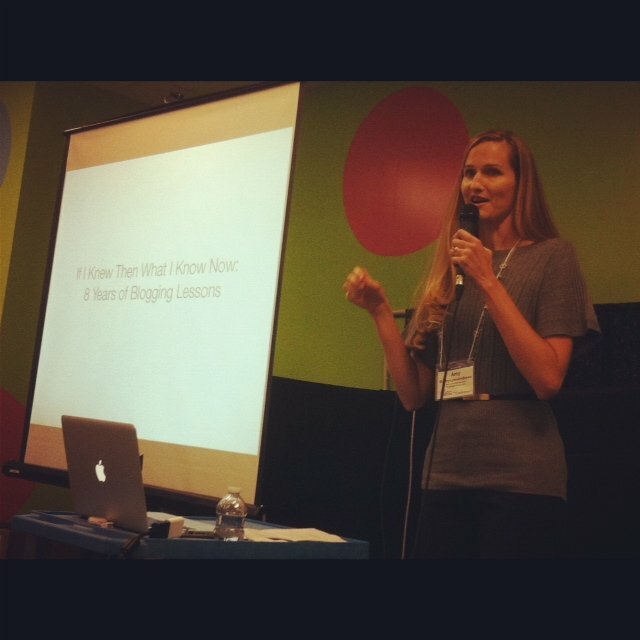 The best part is we didn’t really talk about the “how to’s” of blogging…just the “why” and “who”. Like a re-charge to the system to remember the ultimate purpose of blogging, for His glory! It really was amazing how God was sending us all a clear message! I’m STILL processing all the things He spoke to me. Such depth, richness, truth and direction! So glad He made a way for me to go! Praying for you sweet friend! Sooooo good to see you Traci!! Glad to hear you heard His message as well. I totally understand the “still processing”. Each day I see a new application of what I learned. Thanks for the prayers!!! (hope you had a blast at the Cowboys game). I so so wanted to be there, the speaker line up was amazing, and there were so many sweet faces I wanted to see in person (including yours!). I loved gleaning tidbits from your post – thank you. Was it recorded, or are there twitter streams I can look at to glean more? I’m hoping next year I will actually be in Texas when it happens! oh it would have been WONDERFUL to have had you there, but I completely understand you have a full life right now. It wasn’t recorded, but we did tweet what we could on the #mamaswrite stream. Would love to see your sweet face next year! Fantastic post, Heather!! You pulled amazing thoughts together beautifully. Isn’t it great how He orchestrates things! ?